The MSE Equity Total Return Index continued with its recovery from a weak start to the year, as it extended its positive streak to three straight weeks, as the larger capitalised companies register gains. The index posted a further gain of 0.682 per cent during the week, to reach 8,911.707 points. Performances in the equity market were rather balanced, as from the 15 active equities, eight headed north while the rest lost ground. Investor participation was substantially lower than the previous weeks, as a turnover of €1.4 million was generated across 141 transactions, compared to the previous week’s turnover of €2.1 million. One of the main drivers of this positive performance was once again Malta International Airport plc, which continued on its positive path to set a new all-time high of €6.50 during mid-week trading. The equity eventually closed the week at €6.45, still translating to a solid gain of 2.38 per cent, on a substantial turnover of €252,399 which was generated across 30 deals. On Thursday, the company published its traffic results for the opening month of 2019, showing growth in passenger movements over the last year at a somewhat expected slower pace. The airport recorded a total of 366,015 passenger movements throughout the month, translating to a 4.1 per cent increase over the corresponding period last year. Telecommunications company GO plc also record a substantial increase in its share price, as it closed at the €4.32 price level, a twelve-year high. The 1.41 per cent weekly gain was the outcome of 14 transactions of a combined 50,080 shares. The company announced that the Initial Public Offering of 49 per cent of its shareholding in BMIT Technologies plc has been oversubscribed. The company added that following the pre-allocation agreement with a number of financial intermediaries whereby over 79 million shares were allocated, the balance of 20.5 million shares was made available for subscription by the preferred applicants and the general public. Total applications amounted to just short of 51.3 million shares, thus resulting in an over-subscription of almost 30.8 million shares. Preferred applicants are being allocated the first 10,000 shares in full, as well as 13.688 per cent of the remaining amount, rounded down to the nearest 100 shares. The general public will be receiving the first 5,000 shares in full, and 6.11 per cent of the remaining amount, rounded down to the nearest 100 shares. 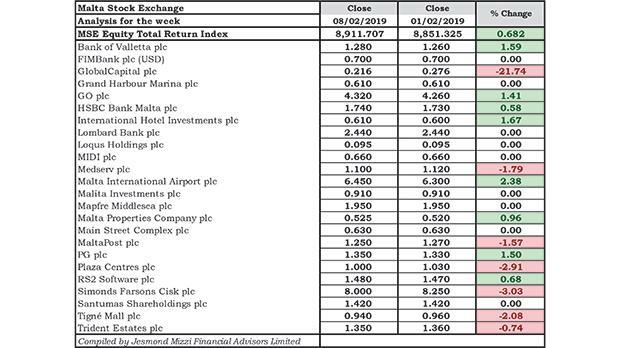 Shares are expected to be admitted to listing on the Official List of the Malta Stock Exchange on February 15 and trading is expected to commence as from February 18. Bank of Valletta plc set the tone on Monday with a gain of 1.59 per cent, to a price of €1.28. The equity managed to maintain this closing price throughout the week, to partially recover the previous week’s loss. Traded volume amounted to 52,895 shares over 17 deals. Its peer, HSBC Bank Malta plc registered contrasting sessions, ultimately closing with a modest gain of 0.58 per cent to close at €1.74. HSBC was the most liquid equity as 177,872 shares changed ownership across 24 trades. On Monday, MaltaPost plc issued the Annual Financial Statements for the year ended September 30 showing a 14 per cent decrease in profit before tax, which amounted to €2.6 million. A final net dividend of €0.04 per share is being recommended by the board to the Annual General Meeting. The decline was the result of the negative trend in letter mail volumes, coupled with postal rates which have remained static for years. In spite of a 4.7 per cent increase in total revenue to €40.2 million, total expenses rose by 6.5 per cent, to €37.7 million, as a result of increased staff and international mail service costs. In terms of trading, the equity closed 1.57 per cent lower at €1.25, as a result of ten trades of 21,209 shares. In the food and beverage sector, Simonds Farsons Cisk plc was one of the laggards, with a fall in value of 3.03 per cent closing at €8.00. A total of 12,500 shares traded across eight transactions. Medserv plc followed suit with a 1.79 per cent drop in price, to close at €1.10. Just two trades were executed, as 8,816 shares were exchanged. The worst performer however, was GlobalCapital plc as a small deal of just 240 shares was executed at €0.216, translating to a substantial price decline of 21.74 per cent. RS2 Software plc traded four times last week, generating a turnover of €30,246. The result was a 0.68 per cent appreciation, to close at a price of €1.48. International Hotel Investments plc announced a new project which will increase in presence in Russia, this time in Moscow. The company is acquiring a minority share in a company being formed for the acquisition of a landmark property in Moscow’s principal avenue leading onto the Kremlin and Red Square. The equity gained 1.67 per cent to reach €0.61, across three trades of 24,397 shares. In the retail sector, PG plc managed to reverse earlier declines, to ultimately close the week 1.5 per cent higher, at €1.35. The equity traded somewhat heavily as 133,114 shares changed hands over 10 transactions. The property sector was dominated by selling pressure last week, as from the four active equities, three drifted lower. Plaza Centres plc was the worst performing equity in the sector, as a couple of deals of 48,500 shares were executed at €1.00, shaving 2.91 per cent off the share price. Similarly, Tigne’ Mall plc lost 2.08 per cent in value to settle at €0.94. Traded volume totalled 30,606 shares across four transactions. Trident Estates plc surrendered a portion of the previous week’s gain, as it was down 0.74 per cent to €1.35. A total of 34,900 shares were exchanged over six trades. Malta Properties Company plc was the only exception in the sector, as it climbed 0.96 per cent to reach the €0.525 price level. In total, six transactions of a combined 50,520 shares were executed. The sovereign debt market registered mixed performances, as from the 24 active issues, ten gained ground and 13 traded lower. Turnover in the market was significantly higher than the previous week, as it totalled €4.6 million over 114 trades. The shortest dated issue, the 6.6% MGS 2019, logged the worst performance, as its price declined 0.35 per cent to €103.74. On the other hand, the 2.1% MGS 2039(I) climbed 0.77 per cent to €104.80. Yields in the corporate debt market were lower last week, as gainers amounted to 23, while negative movers amounted to nine, over a turnover of €2.7 million. On top of the list of gainers was the 4.5% Hili Properties plc Unsecured € 2025, as it fully reversed the previous week’s loss with a 1.45 per cent increase to close at €105. At the other end of the spectrum, 6% International Hotel Investments plc € 2024 lost a sizeable 2.96 per cent in value to €107.02. This article which was compiled by Jesmond Mizzi Financial Advisors Limited, does not intend to give investment advice and the contents therein should not be construed as such. The Company is licensed to conduct investment services by the MFSA and is a Member of the Malta Stock Exchange and a member of the Atlas Group. The directors or related parties, including the company, and their clients are likely to have an interest in securities mentioned in this article. For further information contact Jesmond Mizzi Financial Advisors Limited at 67, Level 3, South Street, Valletta, or on Tel: 21224410, or email info@jesmondmizzi.com.